This striking lady fern has vibrant burgundy color throughout its stems. It is an excellent contrast with the green fronds. Strong growing and dependable, its color intensifies after a couple of years of growth. This fern must be grown in shade to bring out the best of its silver variegation with dark red center veins. A gorgeous addition to a shade garden. Perennial Plant of the Year for 2004. Similar to 'Pictum' with silvery-green fronds, its stems and veins are a much brighter red. The red takes a few years to completely develop. Likes a moist, well drained soil. Very colorful fern with dark violet red interior and bright silver edges puts on quite a show. The twisted pinnules give the fronds a nice full look. Perfect for the shade garden and lovely in cut arrangements. Lacy bright green fronds. Likes moist, humus, acidic soil. Native. A robust, evergreen fern. Easy to grow in moist humus soil. It can handle a little more sun than other ferns in moist soils. 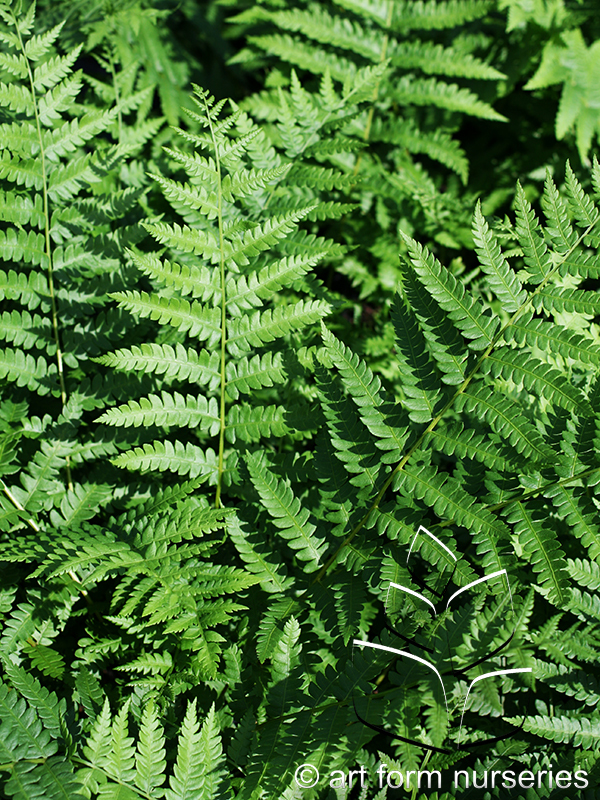 One of the largest ferns whose light green, finely toothed fronds will quickly fill an area with moist soil. Can tolerate some sun if the proper amount of moisture is available. Tall upright fern with cinnamon brown spikes that rise from the center of the plant. Native. Great native evergreen for shaded areas. Dark green, coarse leaflets remain year round and really stand out even in the snow. Excellent ground cover for the shade due to its vigorous growth habit. Lush, bright green foliage. Can handle moist or dry shade. Bluish green fronds are wide spreading. An excellent ground cover in a moist shady garden. Will tolerate some sun with adequate moisture.